Howe led many ASA trips to Black Canyon and Inscription Canyon, a small arroyo at the north end of Black Canyon (Pederson, 1956/1984; Howe, 1980). He found the bird petroglyph that ASA adopted as its logo; the bird is about 20 feet above the road and has a wing-span of over two feet (Pederson, 1953/1983). The petroglyph is unique in the area although a similar bird petroglyph occurs 120 miles away (Haenszel, 1972/n.d.). In 1953, the ASA posted a sign, “This is Black Canyon,” telling visitors about the canyon and asking them to “live in peace with this extraordinary place” (ASA, 1953/1984). Charles LaMonk donated several of his reproductions of petroglyphs in Inscription Canyon to ASA (ASA LaMonk Nos. 9, 10, 14, 35, 38, 40, 69, 77 prepared in 1954 and ASA LaMonk no. 46 prepared in 1964). 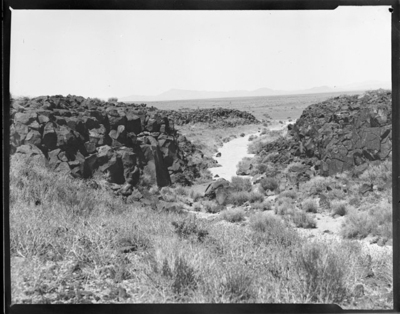 Photographs include some taken in Inscription Canyon. This collection has no photographs of the ASA trip in June 1966 to attempt to repair damage by vandals (Howe, 1966). ASA001-425 – 441 views of the canyon and the surrounding landscape. The images in this collection are copyrighted. Images may be displayed, copied, or used for personal study only. Written permission to reproduce an image for electronic or print publication may be obtained from California State University San Bernardino's Pfau Library Special Collections.